Have you been dreaming of those slimy little creatures most of us prefer not to think of? If you have “frog dreams”, did you know that in Sri Lanka many believe that you will either be blessed with a child or riches? This is just one of many beliefs associated with amphibians–.terrestrial activities of tree frogs will be a harbinger of drought while a field sans frogs and toads will mean crop failure. Not only such interesting tidbits but much more will be at your fingertips in a slim and handy booklet, ‘Amphibians of Sri Lanka: A Photographic Guide to Common Frogs, Toads and Caecilians’ by Anslem de Silva. Although Sri Lanka is one of the hottest hot spots in the world for amphibians, this is the first photographic guide on this important group, says this well-known herpetologist who has over 350 publications, including many books and papers, to his name. As at October 2009, 108 amphibians have been identified in Sri Lanka, with 92 being endemic, explains Mr. de Silva, who has been to all eco-systems in the country, including the Knuckles Range, Horton Plains, Sinharaja Rainforest, Peak Wilderness, camera round the neck, on the trail of amphibians. Scaling trees as tall as 10 metres high or gently peering under rocks and leaves, 70-year-old Mr. de Silva brings stunning photographs, accompanied by simple, non-technical language to any novice who wishes to learn more about amphibians and identify them. He was also the first to publish in England a colour guide to snakes, ‘Snakes of Sri Lanka’ way back in 1990 in addition to ‘A photographic guide to snakes and other reptiles of Sri Lanka’ (co-authored with I. Das) in UK in 2005. “I’ve photographed amphibians in situ (in their own environment) and the description of their external morphology or features will help people to identify them without dissecting them,” says Mr. de Silva whose interest in the creepy-crawlies that most of us shun began when he was still a schoolboy. While studying at St. Servatius College, Matara, his passion at home was rearing marine turtles, baby crocodiles and snakes. However, identification is not the sole objective of this guide on amphibians which has 291 colour images. It also deals with such important topics as ‘Threats Faced by Amphibians’ and ‘Conservation of Amphibians’ to name a few and hopes to make the user of the guide think of these creatures more with empathy than revulsion. For, they are a vital part of the eco-system and essential for the survival of humans. 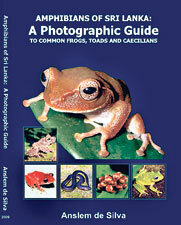 That is why, this Photographic Guide will be a valuable addition to your bookshelf not only if you are thinking of going on a journey into the wild but even at home in your own front lawn or backyard when you see that frog or toad under the flower-pot or by the pond. The guide priced at Rs. 1,250 is available at bookstores or could be ordered through the mail, from Anslem de Silva, 15/1, Dolosbage Road, Gampola (20500) by sending a money order addressed to K.A.L. de Silva and Gampola Post Office. If it is to be sent by registered post, an additional Rs. 100 should be included. Meanwhile, the book will be available at the discounted price of Rs. 900 at the Amphibian Conservation Husbandry Course. 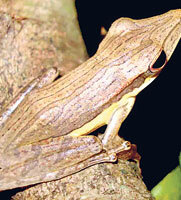 In a first for Sri Lanka, ‘The Amphibian Conservation Husbandry Course’ is to be held in Kandy from November 2-11. The course will comprise two parts, according to Mr. de Silva after whose suggestion to experts at last year’s Amphibian Biodiversity Conservation Workshop held in India, that it has become a reality. The first part will be a two-day programme on ‘Priorities and planning for amphibians’ to be conducted by Dr. Richard Gibson, Amphibian Taxon Officer and Curator Lower Vertebrates and Invertebrates of the Chester Zoological Gardens in the United Kingdom. The other will be a series of lectures by Dr. Gerardo Gracia, Head of Herpetology International Training Centre and Dr. Janie Copsey, Head of Training, Durrell Wildlife Conservation Trust, UK; and local scientists Dr. Madhava Meegaskumbura, Dr. Deepthi Wickremasinghe, Mohamed Bahir and Mr. de Silva. The keynote address is to be delivered by environmentalist Rohan Pethiyagoda. Mr. de Silva has organized many conferences in Sri Lanka including the first National Conference on Herpetology at the University of Peradeniya in 1995 and the first Internal Conference on Herpetology at the Institute of Fundamental Studies in 1996. He was also the Congress Director of the biggest and most prestigious herpetological event in the world: The World Congress of Herpetology in 2001.